PT.Transact+ Fitness Wallets are a convenient, efficient and easy way to allow your clients to pay you electronically at any time without the need to have their credit card or cash on hand. Once a client has set up a Fitness Wallet with you, they can make any personal training-related purchase or payments without having to lift a finger. Payments made using Fitness Wallet are processed electronically with your nominated billing provider. This guide shows you how to set your clients up with their own Fitness Wallets in PT.Transact+ so they can start making electronic payments. It assumes you have a PT.Transact+ Electronic Payments account already set up. 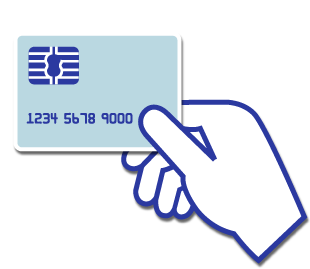 If you don't already have one, you can find out more about Electronic Payments here. This guide shows you an example of setting up a new Fitness Wallet with a client, and also how to change the payment details of a client's existing Fitness Wallet. We will start by setting a client up with a VISA credit card-based Fitness Wallet, then we'll conclude by changing that Fitness Wallet to be bank account-based instead. Tap on No Fitness Wallet to begin the set up process. The first thing you will be asked is to select the type of account your client wishes to use for their debits. You can choose between bank accounts and credit cards. For this example, our client is going to be using their VISA card, so we need to select Credit Card. Once you select Credit Card, you next need to provide the relevant account details of the VISA card to be used. Enter the credit card number, expiry date and the CVV of the credit card, as shown below. Hint: The CVV, sometimes called the CVC or CSC, is the 3- or 4-digit number found on the back of the card. Next, the client is required to sign their authorisation for the creation of the Fitness Wallet. Tap Client Signature and your client can use their finger to sign onscreen. Once signed, you're ready for the last step. But before we proceed, there's one other thing we should explain. In the setup screen shown above, you'll notice there's another button called Client Agreement. This screen allows you to view the relevant agreement that will be established between your client and your billing provider. These are standard terms and conditions that are provided by your nominated billing provider that will be automatically emailed to your client once the Fitness Wallet setup process is complete. This screen allows you to show your client this agreement before they proceed with the setup if that's something they want to do. This step is completely optional and you should use your own judgement as to whether you do this. The last step is to simply tap Create Fitness Wallet Account. You can change the details of a client's Fitness Wallet at any time. The most common reasons you will need to do this are if the client wants to change the account they use for debits (e.g., start using their bank account instead of credit card), or to change the credit card details (e.g., they get issued with a new card or the previous card expired). The process of changing a Fitness Wallet is very similar to the one we followed in creating it in the first place. Locate the client making the change, navigate to their Client Details screen and select the Wallet tab. Tap on their Fitness Wallet, then select Change Payment Details. The same Fitness Wallet screen you saw previously will be shown, allowing you to enter the details of the account your client wants to use. Tap Update Fitness Wallet Account to complete the process. As before, your client will be automatically emailed a new copy of their Fitness Wallet agreement. Now that your client has a Fitness Wallet, they can start making purchases and payments with you electronically. Whenever your client makes a payment either on a new sale or a part-payment on an existing invoice, in addition to the usual options such as Cash and Cheque, you will notice an additional Payment Method available to you: Fitness Wallet. Selecting Fitness Wallet as the payment method will result in your client being electronically debited for the amount of the payment being made. Additionally, you can begin selling your client recurring direct debit invoices. These are special invoices that automatically debit your client on a weekly, fortnightly or monthly basis. You can read our guide on selling recurring invoices here. If you have any questions or need assistance with PT.Transact+ Fitness Wallets or any other related topics, you can contact our friendly support team from within PT.Transact+ itself.